Naomi Honest Beauty | Kimmidolls Figurines | One Price Low Flat Shipping! 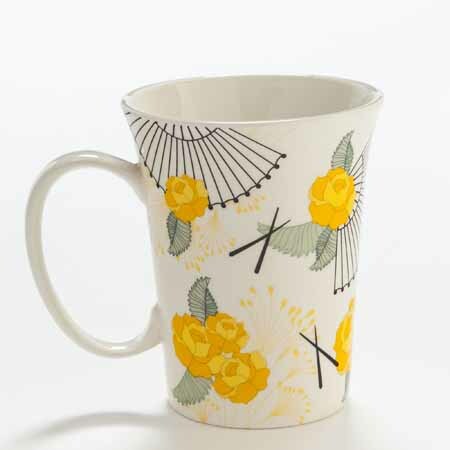 From Enesco Giftrware's Kimmidolls Sentiments Collection, Naomi Honest Beauty 13 Ounce Mug. Made of stoneware. Measures 4.25" tall. Packaged in its own box. I am Honest Beauty. By truly loving who you are and embracing every flaw and imperfection as part of the signature of your life your beauty embodies my honest spirit. May you always be proud of who you are and stay strong and true to the real you. 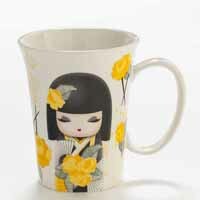 This elegant Kimmidoll mug features a dramatically adorned Japanese doll dressed in a black and yellow kimono holding a bouquet of brilliant yellow flowers and is accented with stylishly designed flowers on both the front and back of the mug. Microwave safe. Not recommended for dishwasher.